Avengers assemble in New York again. Don't worry, the city won't be leveled this time! Discovery Times Square teamed up with Marvel Entertainment to bring the first interactive exhibit that takes you deep into the Marvel Cinematic Universe as you explore the history and scientific origins of Marvel's mightiest heroes. Step into S.H.I.E.L.D. headquarters and enlist as a S.H.I.E.L.D. agent this summer! (We'll just pretend S.H.I.E.L.D. wasn't disbanded, if you haven't seen Captain America: The Winter Soldier). Marvel's Avengers S.T.A.T.I.O.N. 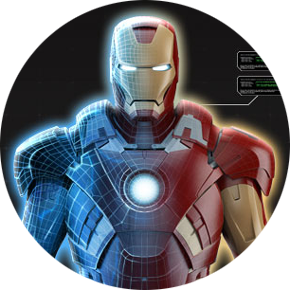 (Scientific Training and Tactical Intelligence Operative Network) Exhibition is a fully immersive exhibit that matches real props from the films with cutting-edge interactive technology, Marvel announced. The high-tech $7.5 million exhibit spans over 10,000 square feet in New York's Discovery Times Square and is designed to be a full-sized replica of the S.H.I.E.L.D. base complete with holograms and activity stations. Visitors of all ages are recruited as agents and given an official ID card that grants them access through airlocks into rooms that hold authentic props from the films including Thor's Mjolnir, Captain America's shield, Loki's scepter, the Tesseract, and more. "You're literally standing in front of a nine-foot tall Hulk and he punches the wall, and the whole building shakes," Nicholas Cooper, the creative director of Victory Hill Exhibitions the company behind the exhibit told NY Daily News. Implementing an exhilarating learning experience to the exhibit, Hulk's fierce punch is calculated in newtons, and that is just one of the many STEM discoveries. With America's major decline in students' interest in math and science, the Avengers S.T.A.T.I.O.N. might just be what is needed to cultivate a nationwide growing interest in STEM education and careers. The super-exhibit opens to the public May 30 and will run through Jan. 5, 2015. Tickets cost $27 for adults and $11 for kids. For more information, click here. Are you planning a trip to New York this summer to experience what it would be like as a S.H.I.E.L.D. agent (and then get shawarma after)? Let us know in the comment section below!